Super fine wire hooks, great for trout, perch and other freshwater games. The lightest, thinnest wires are used among Cultiva single hooks for spoons, and spoons will have the best actions with the lightest hooks. Ultra sharp hook points. 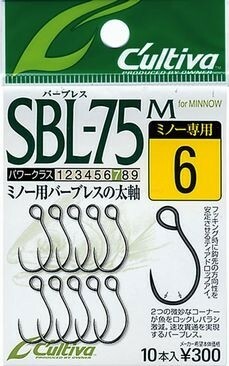 Recommended for up to 0.7kg/1.5lb fish, with 1-4lb test mono lines. Matches well to spoons of 1.0-1.2g #10, 1.5-2.0g #8, 2.2-3.0 #6. Fine wire hooks, great for trout, perch and other freshwater/saltwater games. Ultra sharp hook points. Recommended for up to 1kg/2lb fish, with 1-4lb test mono lines. Matches well to spoons of 2-3g #6, 3.5-4g #4, 5g #2, 7-10g #1. Fine wire hooks, great for trout, perch and other freshwater/saltwater games. Barbless, ultra sharp hook points. Recommended for up to 1kg/2lb fish, with 1-4lb test mono lines. Matches well to spoons of 1.0-1.2g #10, 1.5-2.0g #8, 2.2-3.0 #6. Compared to SBL-35, SBL-31 has deeper gapes to hold better. Fine wire hooks, great for trout, perch and other freshwater/saltwater games. Barbless, ultra sharp hook points. 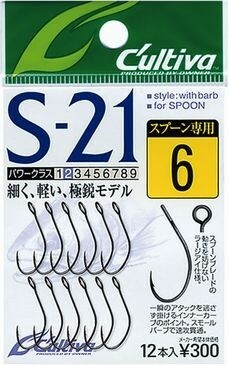 Recommended for up to 1kg/2lb fish, with 1-4lb test mono lines. Matches well to spoons of 1.0-1.2g #10, 1.5-2.0g #8, 2.2-3.0 #6. 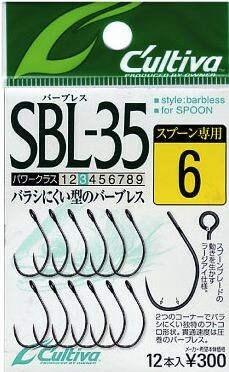 Compared to SBL-31, SBL-35 has wider gapes to hook better. Fine wire hooks, great for trout, perch and other freshwater/saltwater games. Barbless, ultra sharp hook points. Hook surface is coated with fluorine to remove any friction in penetrating jaws with the least power. Eyes are flat to hooks and it matches to minnows at belly eyes. 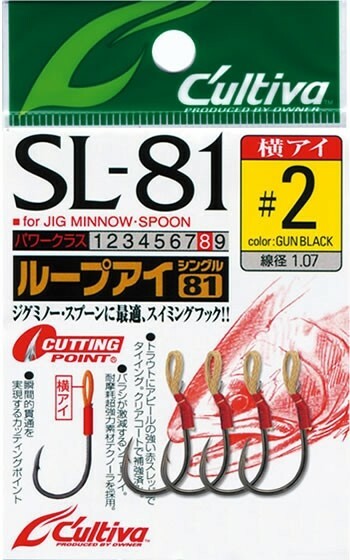 Recommended for up to 1kg/2lb fish, with 1-4lb test mono lines. Matches well to up to 40mm minnow #10, 45mm #8, 50mm #6, 60mm #4. Fine wire hooks, great for trout, perch and other freshwater/saltwater games. Barbless, ultra sharp hook points. Hook surface is coated with fluorine to remove any friction in penetrating jaws with the least power. 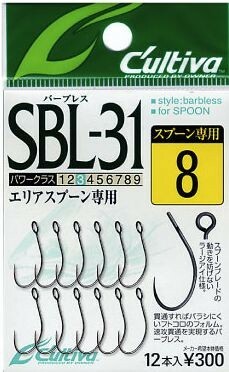 Recommended for up to 1.5kg/3lb fish, with 3-6lb test mono lines. Matches well to spoons of 1.0-1.2g #10, 1.5-2.0g #8, 2.2-3.5 #6, 4-5g #4. Medium wire hooks, great for trout, perch and other freshwater/saltwater games. Barbless, ultra sharp hook points. 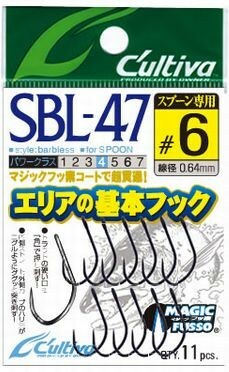 Recommended for up to 2kg/4lb fish, with 4-8lb test mono lines. Matches well to spoons of 1.5-2.0g #8, 2.2-3.5 #6, 4-5g #4. Medium wire hooks, great for trout, salmons, walleyes and other freshwater/saltwater games. Hook wires are forged to have extra strength. Ultra sharp hook points. 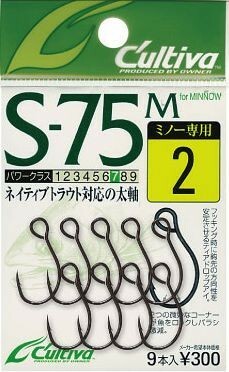 Recommended for up to 2kg/4lb fish, with 4-8lb test mono lines. Matches well to spoons of 0.5-1.2g #10, 1.5-2.0g #8, 2.2-3.5 #6, 4-5g #4, 5-7g #2. Medium fine wire hooks, great for trout, perch and other freshwater/saltwater games. Eyes are flat to hooks and it matches to minnows at belly eyes. Ultra sharp hook points. 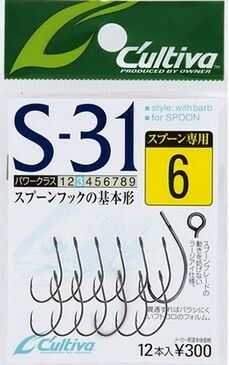 Recommended for up to 2kg/4lb fish, with 3-8lb test mono lines. Medium wire hooks, great for trout, perch and other freshwater/saltwater games. Barbless, ultra sharp hook points. Eyes are flat to hooks and they matches to minnows at belly eyes. 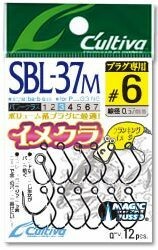 Recommended for up to 2kg/4lb fish, with 4-8lb test mono lines. Matches well to up to 40mm minnow #10, 45mm #8, 50mm #6, 60mm #4. Medium heavy wire hooks, great for steelhead, large trout and other freshwater/saltwater games. 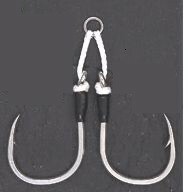 Ultra sharp hook points are bent inside like circle hooks to prevent snags. 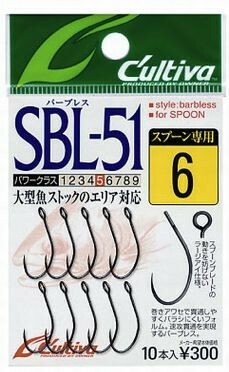 Recommended for up to 4.5kg/10lb fish, with 10-16lb test mono lines. Matches well to spoons of 5-8g #2, 12-15g #1/0, 17-20g #3/0, 25-30g #5/0. Medium heavy wire hooks, great for steelhead, large trout and other freshwater/saltwater games. Barbless ultra sharp hook points. 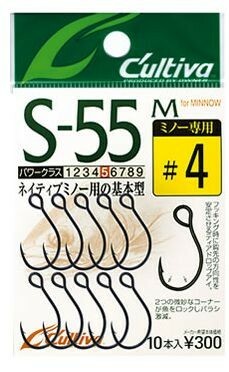 Recommended for up to 4.5kg/10lb fish, with 10-16lb test mono lines. Matches well to spoons of 2-3g #6, 3.5-4.5g #4, 5-8g #2. 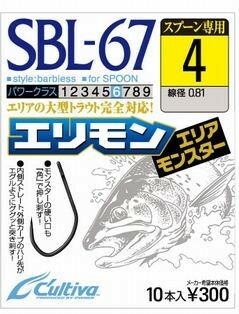 SBL-67 has straight hook points. Medium heavy wire hooks, great for large trout, salmons, walleyes and other freshwater/saltwater games. Eyes are flat to hooks and it matches well to minnows. Ultra sharp hook points. 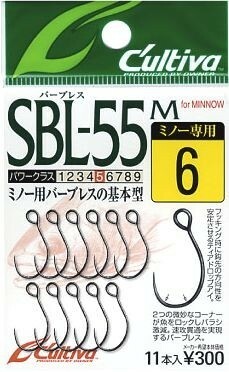 Recommended for up to 5kg/10lb fish, with 20lb test mono lines. 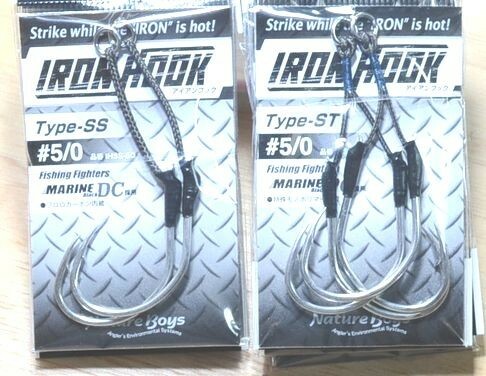 7-10 hooks in package. 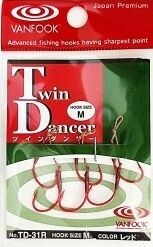 Twin Dancer hooks are to improve catch rate for trout. With the Twin Dancer hooks, spoons work better with less dragging from hooks. 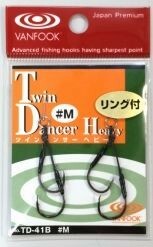 Twin Dancer hooks are tied with soft braided leader allowing spoons to move more freely. AND, Twin Dancer hooks also reduce hook-offs after they hooked on fish. Single hooks penetrate jaws deeper than treble hooks, and the flexible leader keeps the hooks hooked at jaws. This TD-31 has red color fine-wire hooks, great for 3-8lb test lines. Best matching, S for 3g or less, M for 3g, L for 3-5g, LL for 5-8g, 3L for 8-10g. 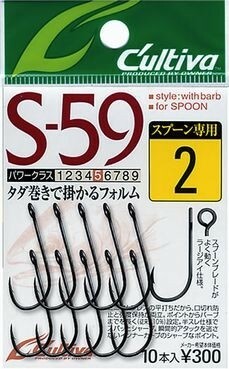 Super strong Shout Kudako hooks with metal rings. Suitable for top water baits. Hook wire is hard pressed to stand for large load. Long-tapered sharp point penetrates jaws with less force. With the rings attached, Ringed Kudako fits well to top water baits, and minnow baits. 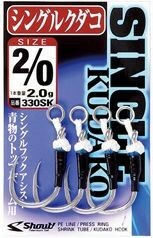 Super strong Shout Kudako hooks tied with short PE braid leader with metal rings. Suitable for top water baits. Hook wire is hard pressed to stand for large load. Long-tapered sharp point penetrates jaws with less force. With the PE braid, you will have less hook-offs after hitting fish. Double Kudako fits well to top water baits, and minnow baits. 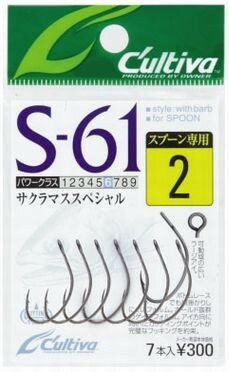 Super strong Shout Kudako hooks tied with very short PE braid leader with metal rings. Suitable for top water baits. Hook wire is hard pressed to stand for large load. Long-tapered sharp point penetrates jaws with less force. With the PE braid, you will have less hook-offs after hitting fish. Single Kudako fits well to top water baits, and minnow baits.